It was a sunny September day on Corsica. In fact it was just a few hours before an encounter with a beautiful fox. You can check its photo a few posts back. Me and my girlfriend were decided to check out one of the adrenaline parks nearby. Our Rough guide recommended quite a few, but the one near the village of Chisa was supposed to be the best one. It was not until we were done with it, that I have found out it is marked as 'D (Difficult) - for those accustomed to the sport'. After a morning swim in the sea we drove a few kilometers up a winding road towards our destination. Soon after the start I have noticed a car was following us. It stayed on our tail until the end of the road. As soon we reached our destination, I have realized that I knew the couple from the other car back from our camping site. It was a French couple of our age and they even spoke pretty good English - that's not so common with the French people we have met. 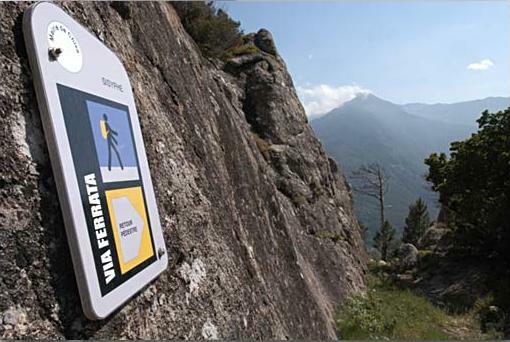 After a short chat with them we have learned that what we have found is more a 'via ferrata' than a usual adrenaline park. That is a mountain route equipped with fixed cables, stemples, ladders and bridges. All that made me and my girlfriend think. We had no climbing experience whatsoever. We were already thinking about finding some more appropriate terrain for our skill level, but fortunately the couple (Marie and Julien) offered us their guidance and support. They assured us, that with their help it's going to be like 'a walk in the park'. Get the irony of that statement? use it - in French of course. Did I mention that we don't speak French? The good thing was that Julien has managed to translate most of it. The standard procedure goes like this: after a couple of minutes of instructions and a few tips you get your climbing belt, helmet and a couple of snaplinks. After that the kind lady gives you directions to the rock wall and a 'bon voyage'. 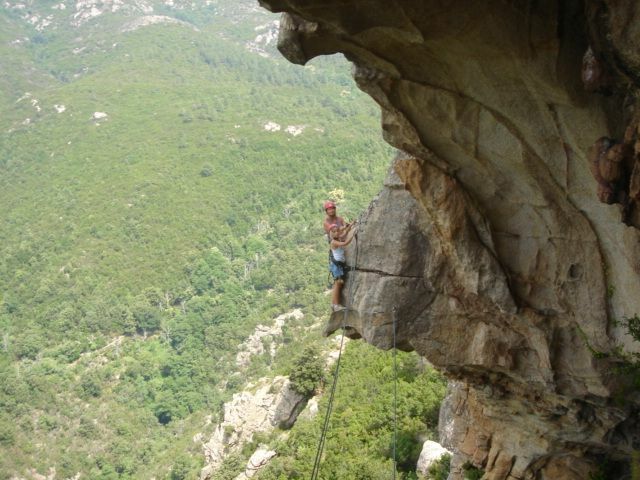 It really isn't something for a non French speaking via ferrata first-timer. And we were on our way. The beginning was not particularly demanding. Nevertheless we have soon found ourselves in the middle of the vertical rock. I didn't have much problem with that, but my girlfriend had to try hard not to look down too often. On one or two occasions her knees were shaking, but she persisted. If you follow the recommendations the park is quite safe. There is always a wired rope in the reach. Just before the scariest two elements of the tour there are also two exits. But if you are new to these things and with all the adrenaline flowing, it can happen that you forget an important thing or two. I can easily imagine some novice doing just that and as a consequence flying through the air and landing a few hundred meters below. No helmet could save you head! If the climb itself with variations of monkey bridges (a low rope to walk on and a high rope to grab with your hands) would seem a bit monotonous to someone, fear not. To avoid such 'monotony', there were also three 'tyrolian slides. Those consist of two slightly declined wired ropes. Onto the first one you put some sort of a pulley whilst the second acts as a safety and emergency break. In a horizontal position, aligned with the cables, you push of the ledge and slide to the other side of an abyss. 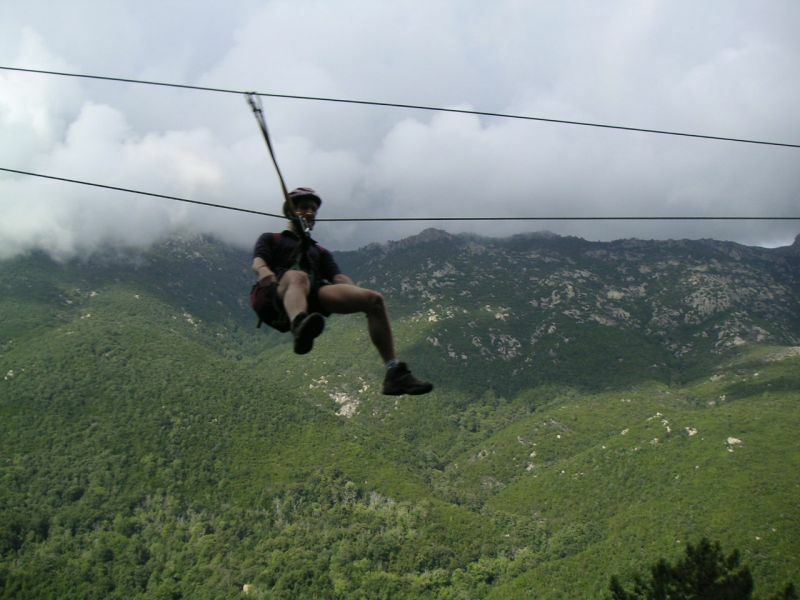 The longest of the three is 240 meters long. It was quite a ride! It took us almost four hours to complete the round tour. After it was over my girlfriend told us that she would have never believed anybody telling her that one day she'll be doing this climb. We have totally enjoyed the whole thing and have decided to do something like that again as soon as possible. Thanks to Marie and Julien once again - we wouldn't make it without you.